Very interesting article in the Washington Post about St. Louis County, Missouri, and how its numerous police departments basically exist to enforce the municipal fine system that funds them. 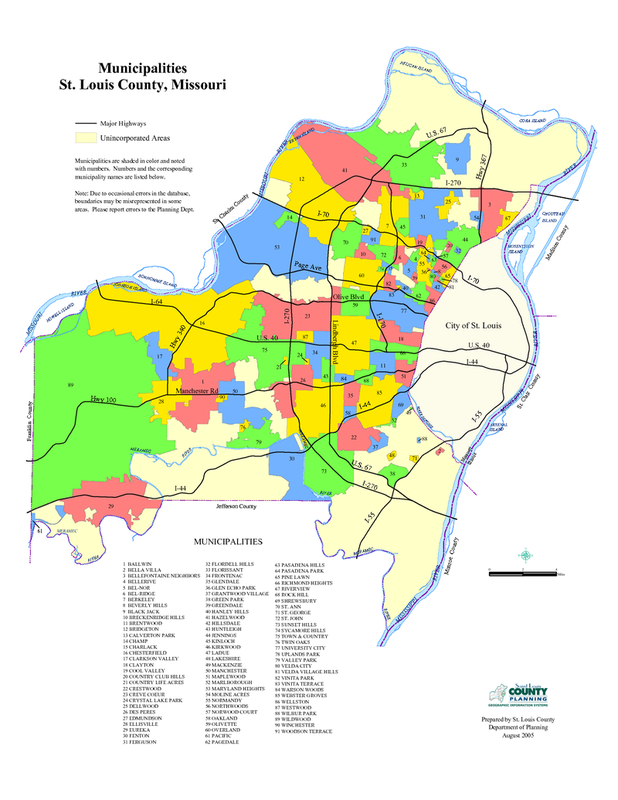 There are 90 municipalities in St. Louis County, and more in the surrounding counties. All but a few have their own police force, mayor, city manager and town council, and 81 have their own municipal court. To put that into perspective, consider Jackson County, Mo., which surrounds Kansas City. It is geographically larger than St. Louis County and has about two-thirds the population. Yet Jackson County has just 19 municipalities, and just 15 municipal courts — less than a quarter of municipalities and courts in St. Louis County. Some of the towns in St. Louis County can derive 40 percent or more of their annual revenue from the petty fines and fees collected by their municipal courts. A majority of these fines are for traffic offenses, but they can also include fines for fare-hopping on MetroLink (St. Louis's light rail system), loud music and other noise ordinance violations, zoning violations for uncut grass or unkempt property, violations of occupancy permit restrictions, trespassing, wearing "saggy pants," business license violations and vague infractions such as "disturbing the peace" or "affray" that give police officers a great deal of discretion to look for other violations. It starts off telling the story of Nicole Bolden, a 32 year old black single mother who's riding dirty with four arrest warrants from three of these stupid little tiny towns. She doesn't have any money, so she's rolling with expired tags and no insurance. She can't afford the fines when the cops pull her over, so her license is suspended, then she's scared to show up in court without being able to pay, so she gets hit with a warrant for failure to appear. Any time she's out on the road is a crapshoot, and soon enough her number comes up. She gets taken to one jail and pays $200 for bond, then direct to the next for another $200. The third wants $1700, and she can't afford that, so she has to wait till the next court session, which is once every two weeks. The judge there agrees to reduce her bond to $700, which she still can't afford, so he sends her back to jail for another two weeks. Her mom had to borrow against her life insurance to get her out. Until recently, the Florissant court was one of many that had barred outsiders from its proceedings. After critics like the ArchCity Defenders pointed out that this violated the Missouri Constitution, a circuit court judge ordered these towns to change their policies. Defense attorneys say some courts still haven't gotten the message. But in Florissant, the city council had a particularly odd response to the order. Town officials claimed the old courtroom was too small to accommodate all the defendants and attorneys, plus journalists, families, and observers. In addition to moving its municipal court to a gymnasium, just last week the council voted to add a $10 fee to every ordinance violation to fund a new, larger courthouse. After all the recent national attention on Ferguson, local attorneys are floored. "It's just completely tone deaf," says Khazaeli. "They got caught violating the law. So in response they're going to build themselves a new courthouse, and they're going to finance it on the backs of the poor. It's incredible." Harvey says there's a much easier way to address the crowded courthouse problem. "They could just hold more court sessions. That would easily take care of the overcrowding. It would also make life a little easier for the people who have to come to court. But that would cost the city money. So instead they're just going to slap a new tax on the poor." Drive along an approximately 10-mile stretch along the east-west Route 115 (also known as the Natural Bridge Road), and you'll cross through sixteen different municipalities. At some points along the route, you'll find one town the right side of the road, and a separate town on the left. There are similar stretches along St. Charles Rock Road (also known as Route 180) to the south, along I-70, and along the I-170 bypass. The town boundaries are drawn in such a way that each municipality in the area gets a stretch of highway, which can be a lucrative source of revenue. "Theoretically, you could be driving home from work on this road, and if you have expired tags or no inspection sticker, you could get pulled over 16 different times in 16 different towns, and written up for the same violations each time," Harvey says. Sales taxes are the primary source of revenue in most St. Louis County municipalities. Wealthier areas naturally see more retail sales, so the more affluent towns tend to be less reliant on municipal courts to generate revenue. In recent years a state pool was established to distribute sales taxes more evenly, but existing towns were permitted to opt out. Most did, of course. Perversely, this means that the collection of poorer towns stacked up along the east-west byways are far more reliant on municipal court revenues. That means they face much stronger incentives to squeeze their residents with fines, despite the fact that the residents of these towns are the people who are least likely to have the money to pay those fines, the least likely to have an attorney to fight the fines on their behalf, and for whom the consequences of failing to pay the fines can be the most damaging. Those incentives then get passed on to the judges and prosecutors the towns appoint for their municipal courts, and the police officers they pay to enforce the ordinances. "I was representing a client in a poorer town and was negotiating with a prosecutor who was also the municipal prosecutor in a wealthier town," Voss says. "He actually told me that if we were in the wealthier town he could cut my client a deal. But he couldn't do it in the poorer town, because there was more pressure on him to generate revenue." Just about everyone agrees on the main cause of this problem in St. Louis County. "There are too many towns," says Vatterott. There are too many towns, and not enough taxpayers to sustain them. How to fix that problem is another matter. There has long been a movement in St. Louis to merge the county with the city. That movement has picked up steam recent years as advocacy groups like Better Together have pushed proposals to merge a number of public services. But real change would require a good portion of these towns to merge with other towns, or to dissolve themselves entirely. That would require the town councils or boards of aldermen to vote themselves out of a job. "You have these fiefdoms across the county where a small percentage of people hold power over a small bit of territory," Kirkland says. "They aren't going to let go of that easily."